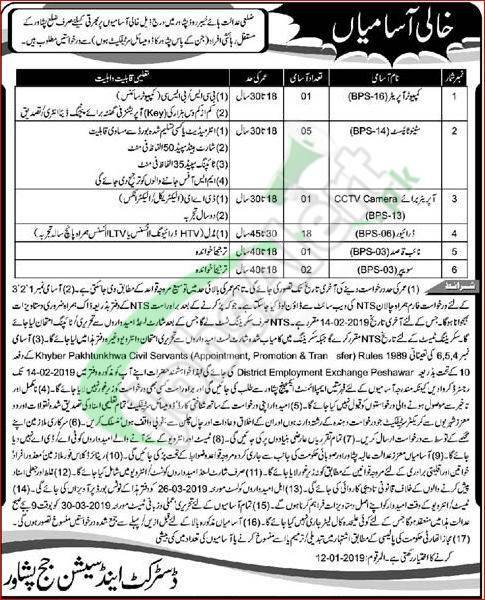 Here in the following we'll discuss about District Judiciary KPK Jobs 2019 Peshawar NTS Application Form Download Online for the vacancies in District and Session Court Peshawar which are on contract basis. Jobs in District Judiciary KPK to apply are (Computer Operator, Stenotypist, CCTV Camera Operator, Driver, Naib Qasid, Sweeper) based at Peshawar. Candidates from all over Peshawar are welcome to apply but they should possess following degrees to apply such as BSc/BCS/Intermediate/DAE/Middle/Primary for the relevant post and the last date to apply is 14th February 2019.